Since winning X-Factor, Matt has been non-stop. He’s been recording music all over the world including Miami, LA and Scandinavia. After a top 3 hit with Ed Sheeran’s penned winner’s single When Christmas Comes Around, he released his debut album ‘Trouble’ in November 2017. His first single from the album, Sucker For You has had nearly 60 million streams on Spotify. After Sucker For You, Matt went back to his Spanish childhood by featuring on Enrique Iglesias’s smash single, Subeme La Radio alongside Sean Paul. This wacky adventure for the whole family is brought to life by Selladoor Family, the producers behind James And The Giant Peach, Seussical and The Owl And The Pussycat and Hartshorn – Hook, producers of the Olivier Award winning Rotterdam, Murder Ballad, Urinetown and American Idiot . 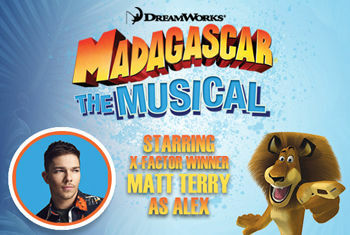 Madagascar – The Musical isdirected by award winning Kirk Jameson with choreography from Fabian Aloise. Designed by Tom Rogers, with Lighting design by Howard Hudson, Sound Design by Chris Whybrow, Musical Supervision from Mark Crossland and Puppet Direction from Emma Brunton. Please call the Box Office on 01274 432000 or visit bradford-theatres.co.uk for more information.